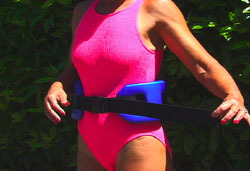 WaterGym® Water Aerobics Flotation Belt | FREE SHIPPING! To determine your size, take a CURRENT, accurate waist measurement. Then view our SIZE CHART & read important FAQ's below - ESPECIALLY #1. The size of the FOAM (not strap) of our belts MAY vary (±1½ inches) in length and (±½ inch) in width in the SAME size range. This is because each belt is custom molded into its streamlined design using small batches of liquid foam, not mass-produced or stamped out from a single sheet of thick foam. Therefore, each belt may differ slightly in size, texture and color. These slight variations will not affect the functionality of your belt. However, if you already have our belt and/or have tried our belt and want us to custom pick you one the EXACT same size, let us know BEFORE you order. See #6 below. 2. I am a MAN. Which size is best? Most men need the MED/LARGE or X-LARGE size because of the extra buoyancy they provide. In water, men tend to be "sinkers" due to their body fat to lean muscle ratio (longer, denser bones & more lean muscle). We want to maximize the amount of foam on their belt. 3. I am a WOMEN with waist sizes of 31" or less. Which size is best? You must wear the small because the foam will be too big for you. If your waist is below 26" call us. Sometimes we have extra small belts. 4. I am a WOMEN with waist sizes of 32" or more. Which size is best? You can wear either the SMALL or MED/LARGE. Below is some information to help you decide. Base your decision upon your buoyancy needs and how far you want the blue foam to wrap around your waist. To see approximately where the blue foam will end around your waistline with our sizes, wrap a tape measure around your waist and measure to 27" for our small and 32" for our MED/LARGE belt. Our X-LARGE belt is mostly for men because it is much wider and thicker, so we don't usually suggest it for women, however some women prefer it. If so, you can measure 34" but also measure 7.5 inches for the width because it is MUCH wider. PLEASE call if you need help! Are comfortable in the deep end of your pool without any flotation at all. Don't care how far the foam wraps around your waist. It does NOT have to go all the way around. We have gals with 45-50 inch waistlines who prefer minimal foam and wear the small. Prefer LESS foam and bulk, and want a more streamlined look and feel around your waist. Don't need a lot of foam to float you. About 85% of our female customers float very well with the small belt. You like the feeling of freedom! Are NOT comfortable in the deep end of your pool without any belt at all. 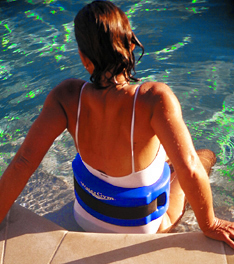 Like the feeling of having the foam wrap as far around your waist as possible. Prefer MORE foam and the greater sense of security it provides. Want to ride higher in the water. Are a “sinker” (athletic, lean, not much body fat) & need extra flotation. 5. My waist is over 50 inches. 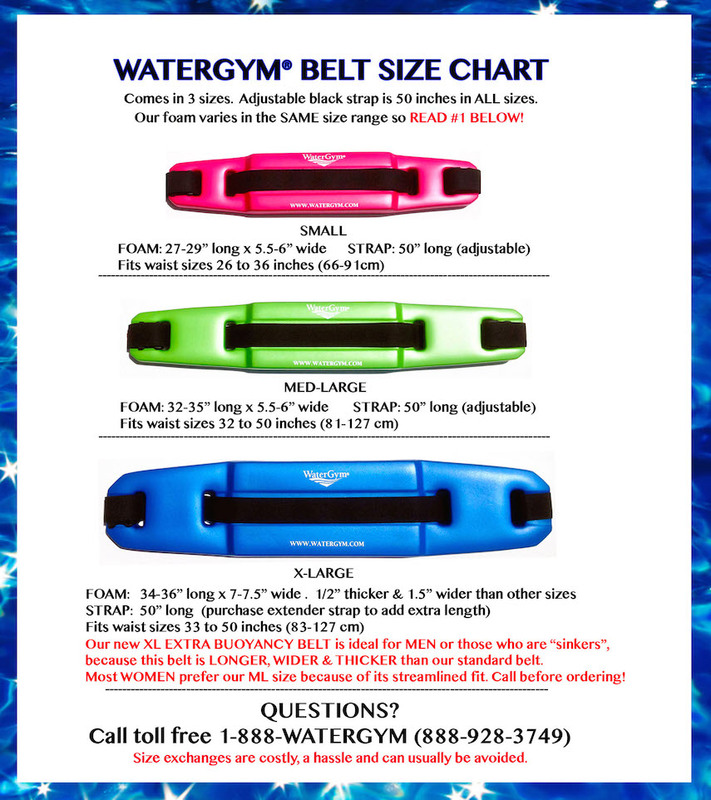 Choose the MEDIUM/LARGE or X-LARGE belt and purchase an additional WaterGym Belt Extender Strap. Simply connect your two straps together and weave them through the blue foam. Your belt now extends up to 74 inches. 6. How can I get a belt EXACTLY the same size as the one I already have? 1. Laying it on a flat table, face down with the WHITE LOGO SIDE DOWN. Measure inside of belt. 2. Stretch it fully flat. Measure the full length (end to end) and width. 3. Call us with your measurements: 1-888-928-3749. 7. 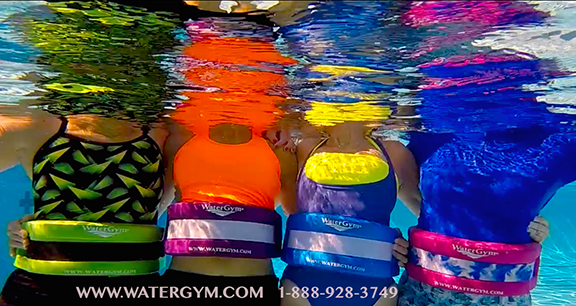 Is there a "weight limit" to the WaterGym® Belt? 8. 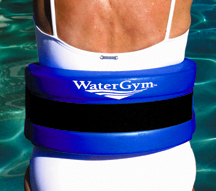 How do I know your WaterGym® Belt will float me? As you see from the previous question, it's impossible for us to know if our belt will float you. GOOD NEWS! We get very few returns, as our belt floats most everyone. Try it and return it if you’re not completely happy. 9. What if I choose the wrong size? May I exchange it for another size? Yes. Make sure to call us if you need help in choosing your right size belt. If you live in the Continental U.S., we ship your initial belt out to you for free (you save up to $12.40). However, size exchanges are not included in this. We are super good at helping you pick the right size so call us toll free 1-888-928-3749. See our return and guarantee policies here.